Why should your mail be boring? 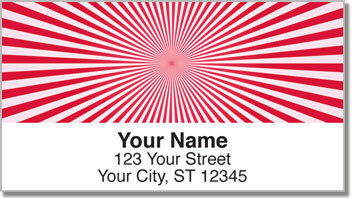 Give it a unique look with this trendy starburst design on bold red return address labels! We're trying not to use words like "explosion" to describe something that goes on your outgoing mail. But we couldn't help it! A blast of invigorating style is exactly what your letters and packages get with these cool labels. Stick them on every envelope for a fantastic finishing touch. The best thing about your new labels is that they are self-adhesive. That means you'll never ever have to painstakingly print your name and address again. Did we just blow your mind? Get your own Red Starburst Address Labels right now! You'll also find three other color choices and a version with all four shades.